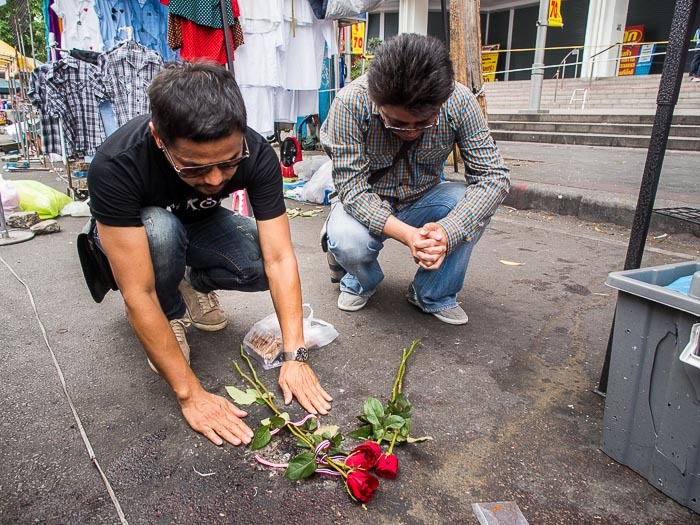 Men lay flowers on the spot where two children were killed by a grenade attack Sunday evening. It was a bloody weekend in Thailand. Men in two pickup trucks attacked anti-government protestors in Trat, a few hours east of Bangkok. They threw grenades into the crowd and then opened fire on protestors. They killed a child and sent scores to the hospital. Less than 24 hours later somebody fired a M79 grenade launcher into a crowd of people around food stalls in front of a Big C department store in the Ratchaprasong area of Bangkok, in the center of one of the protest areas and across the street from Central World, one of Bangkok's busiest shopping malls. At least three were killed. Two children, siblings out for an evening with their father, and a woman. Another child remains in critical condition in a Bangkok hospital. 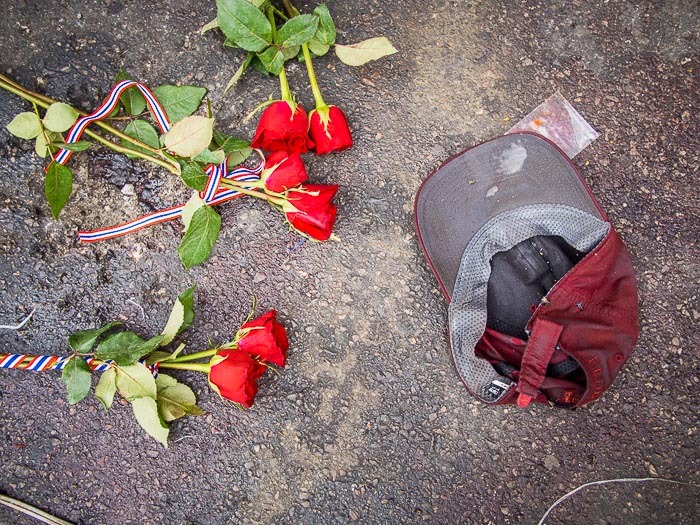 Roses left by mourners next to a bloody ball cap where a grenade exploded on a busy Bangkok street Sunday evening. These are the latest incidents in a winter filled with violence. There have been nearly nightly shootings and grenade (or IED) attacks on guards at protest sites. On February 1, government supporters on their way to guard a polling station were attacked by anti-government protestors who pulled assault rifles from feed corn sacks and sprayed a Bangkok thoroughfare with automatic weapons fire. (The men were lionized by Suthep as his "popcorn army.") Several were injured, one permanently paralyzed, in that incident. Election day, anti-government protestors fired on a group of people trying to get to a polling place to vote. No one was hit in that incident. Last week police tried to clear protestors from protest sites near Government House. Suthep's popcorn army opened fire on police with rifles and grenades, killing two. This weekend government supporters struck back with the attacks in Trat and Ratchaprasong. There is a nascent peace movement in Bangkok. There have been several candle light vigils that draw a few hundred people who decry the violence and pray for peace, but it doesn't seem to me like anyone is listening. 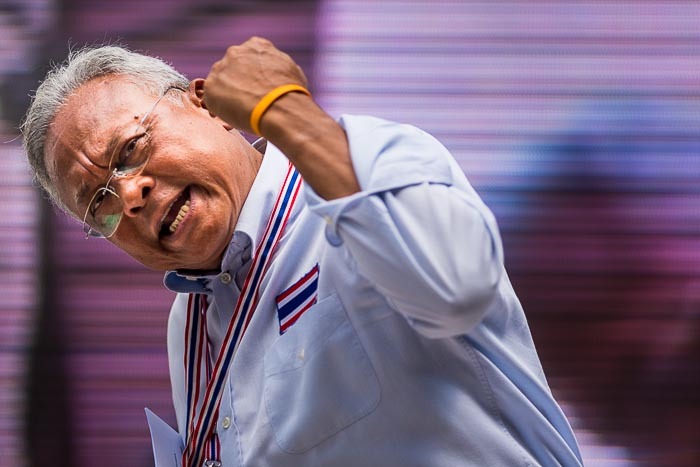 Suthep Thaugsuban, leader of the anti-government movement, speaks to his supporters from the Silom stage Monday afternoon. He uses these venues to thank his "popcorn army." When Suthep takes the stage he speaks passionately about rooting out the corruption of the Thaksin regime. He promises to hound Prime Minister Yingluck Shinawatra and make her life impossible. Then he pivots and thanks his popcorn soldiers for their work and promises Red Shirt leaders that they will greeted by the "popcorn army" if they come to Bangkok.